The beauty of fake turf is that it provides a real alternative to natural grass. This makes it ideal for home owners who would like low maintenance and green lawn all year round, as well as councils and any sporting clubs which need high quality fake grass. Its low maintenance properties: no need to ever water your artificial grass! Pet friendly - enthusiastic dogs won't be able to dig up your fake grass! Another benefit of fake lawn is that it saves you precious storage room, room otherwise occupied by a cumbersome lawn mower! Another enormous advantage of a synthetic lawn solution is that it saves you time! You never need to spend time worrying about looking after your synthetic turf. 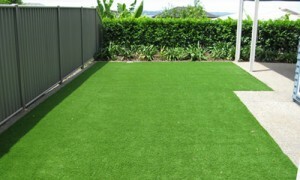 Green all year around - artificial turf has an even texture and look which you will love all year round! So if your home - or business - needs the functionality and benefits of fake turf, get in contact with us today to organise your synthetic grass turf for Geelong, Werribee, Hoppers Crossing and Melbourne. With Geelong Hoobler Stone something we sell a lot of, we also sell a great range of Melbourne outdoor blinds too. One of the most luxurious turf surfaces suitable for lush landscaping designs. The 40mm strand length creates a dense pile which is soft and real to life feel underfoot. Three different coloured and textured yarns have been used to create a multi-dimensional weave. The 40mm pile creates a lush look and texture making it perfect for landscaping applications. Two textured yarns combine to display a natural, freshly mown look. Spongy underfoot, the Urban Design is perfect for large areas. Urban Everlawn is one of our most popular surfaces, with a 40mm pile creating year round. The dual yarn weave combines to create a quality surface perfect for large areas. Real Lawn' look created by the dense two tone weave. Three yarns (including a beige yarn used at base) combine to create one of our most real looking surfaces available. Thick and lush underfoot, Urban All Seasons is perfect for large area landscaping. With a short, densely stiched pile, the Urban Play is perfect for residential tennis courts. Urban Play is available in 5 colours including Buffalo Green, Rust, Blue, White and Yellow. Great durability created with the sports grade Polypropylen yarn. Tufted cut pile turf perfect for landscape design. Dual green coloured yarn creates a great look. A great turf suitable for cricket pitch, providing consistent bounce performance. A dense but very short pile of 9mm the Urban Test 9 is available in Buffalo. A non-directional turf that provides a great golf putting surface or general floor covering for patios, balconies or around pools. A dense, 15mm pile creates a firm surface. *Available in Buffalo Green only. Available in Bowls Green or white. Suitable as a floor covering or for a cricket pitch with a short 9mm weave and dense pile.